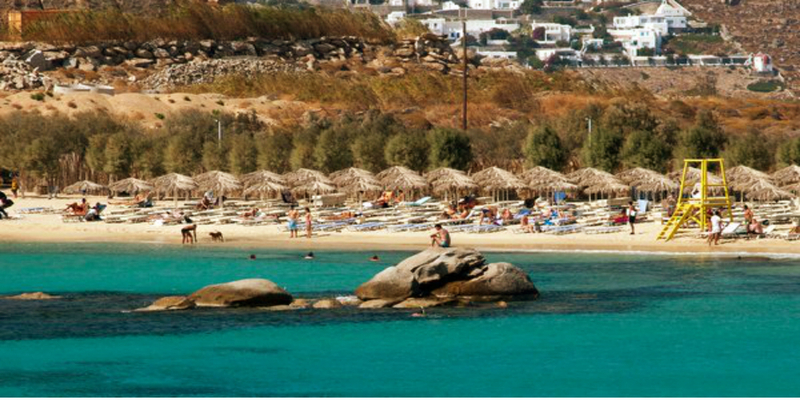 One of the most popular beaches of Mykonos is Paraga, on the south coast of the island. Only 6km from the town of Mykonos and consists of two sandy beaches, where the southern beach is the calmer and the northern one is fully organized. Paraga beach attracts thousands of tourists every year from April till October. A wide range of people who visit Mykonos prefers Paraga beach. Easy access, either by car, taxi or by the sea boat with local boats departing several times a day from Platis Gialos beach. The northern side is a fully organised with sunbeds, and a lot of beach bars and taverns. At Paraga beach you will also find Mykonos Camping in an excellent spot with a great view. Nudists also love Paraga, and prefer the right part of the beach. If you decide to stay at Paraga beach until the sunset, you will enjoy the amazing view on the background of the horizon looking at the sun setting behind Delos Island.